During October Texans have a front-row seat for one of nature’s most amazing migrations — monarchs are moving through the state. And in West Dallas, some students are volunteering for a project that could help protect the species. Nine members of the Nature Leaders Club at Rosemont Elementary gathered around their science teacher, Brett Turner, for some final instructions on how to tag monarch butterflies. Sixth grader Candy Preciado wielded a butterfly net to catch monarchs for the tagging project. Armed with soft mesh nets attached to long wooden polls, they began a slow walk across the Twelve Hills Nature Preserve. Their mission: to carefully capture the world’s furthest migrating butterfly, and gently place an adhesive location tag the size of an eraser on a rear hind wing. Joscelyn Segoviano, a sixth grader, knows just where to look for the fluttering, orange wings, laced with dramatic black veins. The odds of finding monarchs this time of year are pretty good because this is the height of the fall migration. Last spring, monarchs passed through Texas as they flew north from their winter nesting grounds in Mexico, laying their eggs on milkweed and reproducing as they traveled. Those butterflies lived just three to five weeks. This fourth generation that’s returning might live eight or nine months. Instead of reproducing, they’re saving their energy. They’re gorging on flower nectar to fuel a flight that lasts up to 2,000 miles and their hibernation until spring. “This is one of the few organisms that actually gains in mass as it moves south. 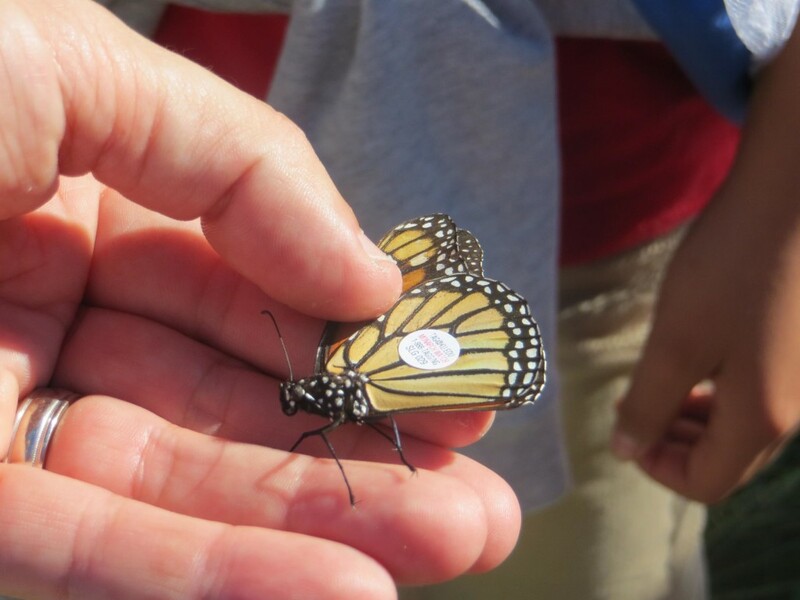 They need that gain because they live off that fat at the wintering sites in Mexico,” says Chip Taylor, the University of Kansas biologist who founded Monarch Watch, the tagging project for which the Dallas students have volunteered. In the past two decades, people have found more than 16,000 tagged butterflies and contacted Monarch Watch through the email or phone number on the tag. Taylor says the information is helping scientists understand the monarchs’ migration routes, how they’re affected by weather and how human activities might be contributing to a decline in the population. Taylor says herbicides used on genetically-modified crops in the Midwest are a prime concern. “They’ve come in there with Roundup-Ready corn and soybeans and they’ve spraying the fields with a herbicide and that has effectively eliminated milkweed from about 100 million acres of corn and soybeans. And that has driven the monarch population down,” Taylor says. Taylor says protecting milkweed habitat in Texas is especially crucial because the monarchs pass through this state twice a year. The West Dallas Nature Leaders are eager to do their part but they’re having a little trouble trapping their prey. But Turner, the teacher, was prepared. He brought four captured monarchs just in case the students weren’t quick enough with their nets. “Read me those six digits down at the bottom,” Turner told one student as he recorded the tag number, location of the release and the gender. He told another student to peel the tag off a sticky sheet and carefully place it on the edge of a wing. Cheers filled the preserve and students screamed “goodbye” as they released the tagged butterflies. Sixth grader Candy Preciado was hopeful. “I really want them to go to Mexico and be safe. And if somebody does catch them let us know,” she says. She says she hopes to learn the butterflies tagged in Dallas make it home where they’ll begin the cycle of migration again next spring.